« Where have all the English Cherries gone? Cherries dipped in chocolate are a wonderful way to impress your dinner guests or give as a present to someone: they are simply delicious. To make these pretty dainties you will need: large, dark cherries with the stalks intact, washed and dried. I used the variety Hertford, home grown of course. This is a richly flavoured cherry, large and meaty with plenty of flesh making it ideally suited for this purpose. Kordia would be another good cherry to try. The other ingredient is dark chocolate, melted in a small basin over a saucepan of hot water. A 200 gms bar will yield sufficient for well over 40 chocolate coated cherries. In my experience ‘cooking’ chocolate does not work, you need the best eating quality. To successfully coat the cherries, you must devise a means of suspending each cherry by its stalk whilst the chocolate sets. I used my oval plastic hanger with pegs that usually holds socks, etc., on washday! Perhaps, a taunt string stretched between kitchen unit handles might work or a wire coat hanger and clothes pegs. But before you begin, remember to lay some greaseproof paper underneath to catch any drips. 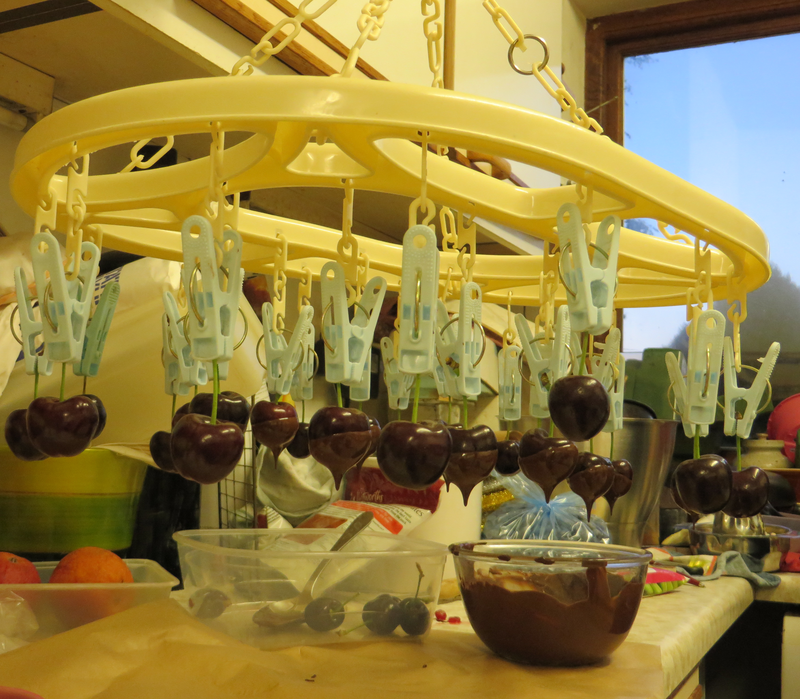 The next step is to suspend the cherries, that is, attach them to the clothes pegs, then partially immerse each cherry, one by one, in the liquid chocolate by lifting the bowl of liquid chocolate up to the fruit and allow them to set. When they are ready, take great care dismantling them from their drying device and unpegging the cherries. Finally store in a box, or display and enjoy them! They will keep well in the fridge and are best served straight from the fridge.